20180: 99-00 Cadillac Escalade Billet Grille Insert (High Density 21 bars.) This polished billet grille insert has an approximate installation time of about 1hr and comes with complete directions and hardware. 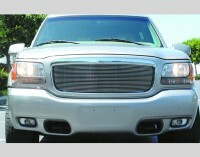 The emblem can be re-attached to the Billet Grille if desired. Modification of OE factory grille is required. Backed by five year manufacturers warranty. Made in USA. Tell your friends about the Billet Grille Insert (High Density 21 Bars). Share this product on Facebook, Twitter, MySpace or send an email to a friend!